Arctic Heat Compression "BACK WRAP" HOT AND COLD "
The Arctic Heat Compression back support straps on like a normal belt adjusting in the front. 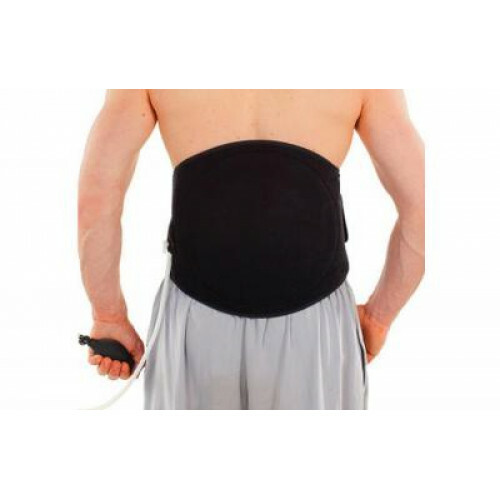 When compression is applied, the wrap delivers a deeper cold and/or heat therapy treatment to your back allowing you to be hands free while doing so. This wrap also acts as a lower back lumbar support without the cold/heat gel pack inside. The removable gel insert may also be heated in the microwave (20-30 seconds) then in 10 second intervals after that to desired temperature. A hydroccolator may be used as well. Again, by having clothing between the skin and the wrap this warm insert, along with our compression, sends moist heat to the core of the site. By warming the tissue it allows for a better pre-event warm up, increases range of motion, and allows you to move in a more pain free way.